RFK in the Land of Apartheid: A Ripple of Hope premiered August 2011. The story of Senator Robert Kennedy's influential June 1966 visit to South Africa. Robert Kennedy arriving in Cape Town, the site of his famous "Day of Affirmation" speech. Featuring never before seen archival footage, and interviews in South Africa and the United States, filmmakers Larry Shore and Tami Gold tell the little-known story of Senator Robert Kennedy’s influential June 1966 visit to South Africa during the worst years of apartheid. The filmmakers explore the visit through the sights and sounds of present-day South Africa and offer a unique portrait of Senator Kennedy in action at an important moment in American and South African history. Robert Kennedy’s visit gave opponents of apartheid — both black and white — hope and courage to challenge the apartheid system at a time when they felt isolated and few in the outside world knew what was happening in South Africa. The film evokes the connections between the struggle for racial equality in the United States and South Africa. 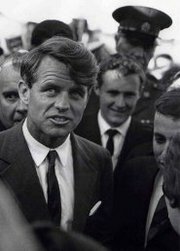 RFK in the Land of Apartheid follows Kennedy in South Africa during the five-day visit, including his famous “Day of Affirmation” speech at the University of Cape Town on June 6, 1966, and his visit to Stellenbosch, the pro-apartheid Afrikaans university. Robert Kennedy with Chief Albert Lutuli, the first African Nobel Peace Prize winner, who was banned and living in internal exile. "It is from numberless diverse acts of courage and belief that human history is shaped. Each time a man stands up for an ideal, or acts to improve the lot of others, or strikes out against injustice, he sends forth a tiny ripple of hope, and crossing each other from a million different centers of energy and daring, those ripples build a current which can sweep down the mightiest walls of oppression and resistance." Another high point of the film is Kennedy’s meeting with one of the unknown giants of South African and African history — Nobel Peace Prize winner Chief Albert Lutuli, who was banned by the government and forced to live in a remote rural area. The film travels with RFK to Soweto, the largest black township, where he meets thousands of people and gives voice to Chief Lutuli’s call for a free South Africa. RFK in the Land of Apartheid tells an unusual story that is relevant to ongoing struggles for democracy and human rights around the world today. RFK in the Land of Apartheid: A Ripple of Hope was produced by Larry Shore, directed by Tami Gold & Larry Shore, of Hunter College, and edited by Harry Kafka with a soundtrack by Jason Moran. © Shoreline Productions, 2015. All Rights Reserved.